They were just getting settled in their classrooms when the worst terror attack in U.S. history unfolded right outside their classroom windows. They saw planes hit buildings. They saw bodies fall. 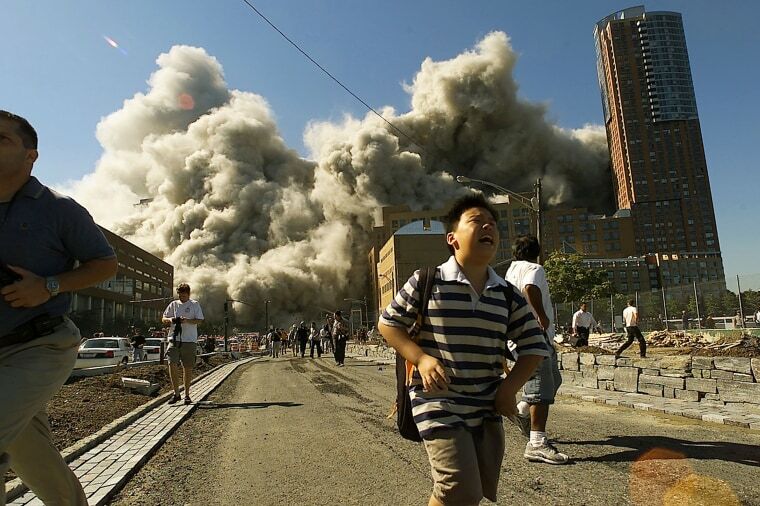 Eventually, they made their way out, through the maelstrom of dust and debris, as the towers fell just blocks away. On Tuesday, many of the students who fled the 2001 attack were wrapping up work when the news began creeping across their computer screens: another terror attack, in the same neighborhood, outside the very classrooms where they went to school 16 years ago. They are no longer students, but the latest attack, which killed eight people, unleashed a familiar cascade of dread. Jill Weiskopf, director of corporate communications at Condé Nast, was working in her office at One World Trade Center when she got the news Tuesday that the driver of a rented truck had mowed down pedestrians and bicyclists just blocks away. The attack ended when the driver hit a school bus, fled on foot and was captured by police. The 9/11 attack had an enormous impact on downtown schools and their surrounding community. There are three schools on the corner of Chambers and West Streets near the Trade Center site: P.S. 234, I.S. 89 and Stuyvesant. All three closed after the attack; Stuyvesant opened a month later but the others didn’t reopen until the following spring, forcing thousands of students to relocate to other schools around the city. That sense of desperate uncertainty came back to Gina Cucchiara, a dentist in Queens who was a senior at Stuyvesant in 2001, when she saw the news on Tuesday. In other words, just like it was that day 16 years ago, when Cucchiara’s cellphone didn’t work and she couldn’t reach her parents as she walked from the school to midtown Manhattan on her own. It took hours for her to make contact with home. Mia Ardito, who was in the eighth grade at I.S. 89 and is now an artist Brooklyn, recalled the look of fear on the faces of adults and people in authority back in 2001. And those looks returned on Tuesday. At Stuyvesant, teachers created projects around 9/11. They put out a special issue of the school newspaper, The Stuyvesant Spectator, filled with stories, essays and photographs about 9/11 and its effect on the school and the community. The students and faculty also wrote and produced a play, “With Their Eyes,” based on their experiences on the day of the attack and afterward. “Those were really helpful and healthy for processing for both the kids who put them together and for the community that experienced it,” says Holly Epstein Ojalvo, who taught freshmen and seniors at Stuyvesant in 2001. Normalcy and structure were key to helping students move forward, she said, then and now. “But there’s a delicate balance between pretending everything is normal and doing things that deal with the situation,” she said. “Students need counselors, they need teachers who understand them. Some need a project, some need to talk about it. Sometimes it’s surprising, the range of kids’ reactions." CORRECTION (Nov. 2, 2007, 12:10 p.m.): An earlier version of this article misstated the length of time it took Stuyvesant High School to reopen after 9/11. The school reopened a month later, not the following spring.